Let me just state for the record that I am a sunscreen snob, especially when it comes to my face. I don’t like sunscreens that feel too heavy, look ghostly white, or break me out. I’m also fairly ingredient savvy, so there have been plenty of sunscreens over the years that have failed to impress me simply because I didn’t like the active ingredients. 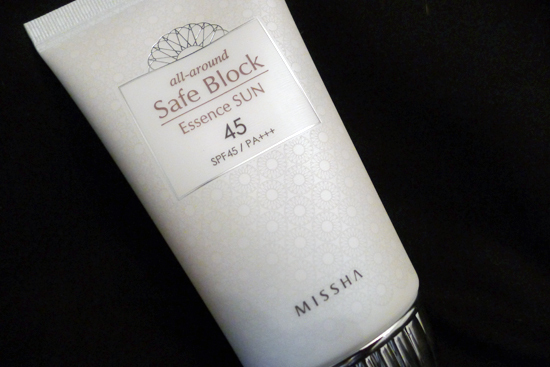 With all that in mind, Missha’s All-Around Safe Block Essence Sun cream ($14) has recently made it past my unforgiving scrutiny, and is now a part of my regular sunscreen lineup. This is a broad spectrum chemical sunscreen that boasts SPF 45 /P +++ protection, which means it protects against both UVB and UVA rays. This is worth noting because there are still, for some awful reason, a ton of facial sunscreens on the market that only provide UVB protection. If you’re wondering what the difference is, the simplified answer is that UVB rays cause sunburn, but UVA rays can penetrate the deeper layers of our skin, creating sun damage and aging. As far as chemical sunscreens go, the active ingredients in this are all known for being relatively non-irritating. If you’ve had bad luck with avobenzone or oxybenzone in the best, don’t fear. These ingredients are far gentler. All three of the active ingredients provide some heavy duty UVB protection. Octinoxate and Phenylbenzimidazole Sulfonic Acid are responsible for the UVA protection, though the UVA protection they provide is weaker than their UVB protection properties. The UVA protection provided is perfectly adequate for daily wear if you work indoors, especially if you’re wearing a BB cream on top of this (BB creams usually contain physical UVA blockers), but if you’re spending a day at the beach or walking the city streets on a sunny day, you’re going to need something with more heavy duty UVA protection than this. One of the advantages of a chemical sunscreen like this is that there is absolutely no white cast to speak of. It also absorbs quickly, and doesn’t feel heavy or leave a weird, sticky film on your face. The weightlessness of it is spectacular! Licorice Extract: One of my favorite actives! Licorice root is anti-inflammatory, anti-irritant, anti-viral, anti-bacterial, and has skin brightening properties. Portulaca Oleracea (Common Purselane) Extract: contains essential fatty acid Omega 3, as well as Vitamins A, B, and C. It also contains antioxidants, including alpha lipoic acid. Because of these ingredients, this sunscreen has some nice moisturizing and skin brightening properties. 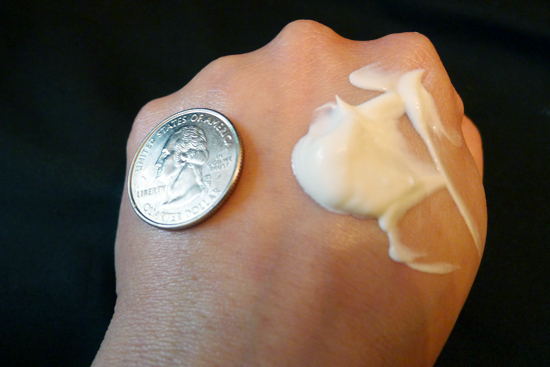 Although it is slightly moisturizing, I wouldn’t skip your moisturizer unless you have extremely oily skin. 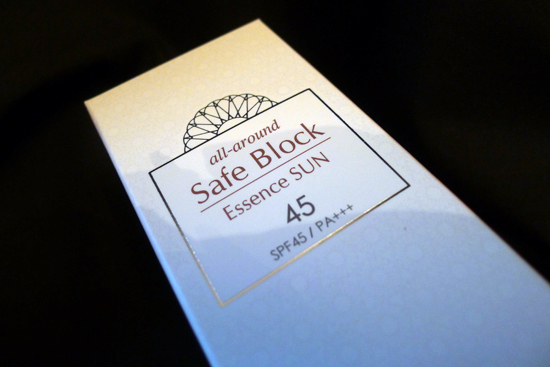 All-Around Safe Block Essence Sun cream is meant to be applied as your last skincare step, after your moisturizer. An additional bonus: All-Around Safe Block doesn’t smell like stinky sunscreen chemicals. It has a very light floral scent that I find extremely pleasant. The floral scent disappears upon application. An additional sunscreen tip: In general, you should be applying at *least* ¼ teaspoon of whatever sunscreen you use on your face to get the full SPF & PPD protection stated on the front of the bottle, regardless of the brand. I have seen a lot of sunscreen reviews that boast about how little product you need to cover your face. While it might be true that a little of a particular sunscreen can be spread over a large area of your face, skimping out on it just because it’s easily spreadable isn’t going to give you the sun protection you need. Be generous with your sunscreen application – ¼ of a teaspoon is quite a bit more than you might think! See my photo below for reference. Believe it or not, that’s 1/4 of a teaspoon. That’s how much sunscreen you should be putting on your face, no matter which sunscreen you use. 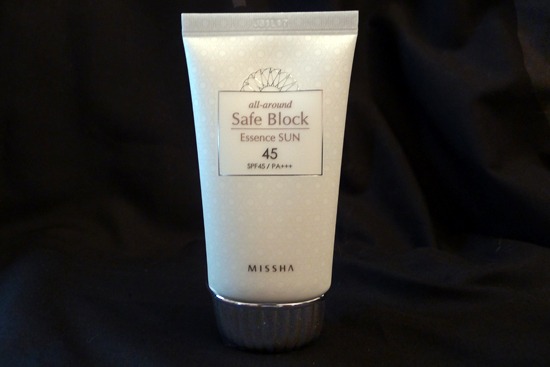 For the entire month of May, Missha All-Around Safe Block Essence Sun cream is Buy One Get One Free on their US website, so it’s an excellent time to pick this up. You can also find it on eBay for about $10 with free shipping, but it ships from Korea so it may take a while. Performance: 3/5 – Weightless, no white cast, slightly moisturizing & brightening, works well under makeup. Provides strong UVB protection, adequate UVA protection, but I wish the UVA protection was stronger. 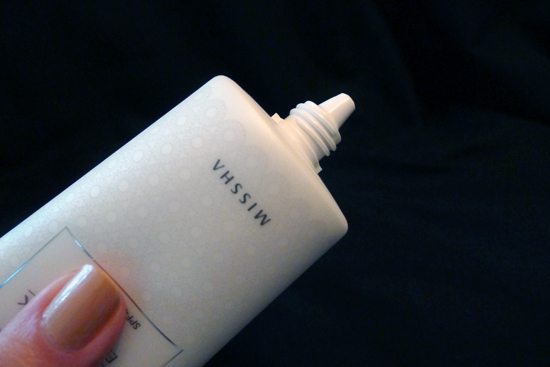 Value: 5/5 – $14 for good facial sunscreen is basically drug store pricing! I love how much work and research you put in your reviews! It’s great! I have one question though, my skin is really dry, so oil-free sunblocks tend to flake… Is this suitable for dry skin? Hey Summer! I have dry skin and can’t use oil-free sunblocks either, and I think this works great! Thank you so much for the thorough review. I was wondering though how to use this sunscreen in conjunction with my skincare, after moisturizer but before my bb cream? or after I put on the bb cream? I’m a little confused lol. I don’t think it’s accurate to say that this is a product with drugstore pricing. $14 at the drugstore gets you 100mL+ of sunscreen, not 50mL. That’s a good point, Betsy. Price per ounce is definitely higher for this one! How long would this sun screen last before a repurchase is necessary? Sorry for being such a stalker (not really sorry), but I’ve read several times at plenty of blogs that Koreans don’t use the PA-rating system in the same way that the Japanese do, and that “PA+++” is the maximum UVA protection in their “system”. Do you know anything about that? Confused.